Snyder's Heating & Cooling is proud to serve the Bellefontaine community! About Bellefontaine, OH - Happy to be your hometown Heating & Air Conditioning Contractor! Bellefontaine is a small city in western Ohio. It is 60 miles north of Columbus and 100 miles south of Toledo. 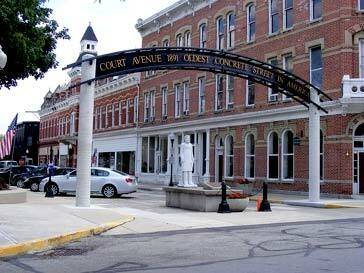 Bellefontaine is positioned in Logan County and serves as the seat of government therein. According to a 2016 United States Census Bureau report, Bellefontaine is populated by approximately 13,172 people. Bellefontaine is in a region of the United States that was inhabited by Native American Indians of various tribes before the arrivals of European peoples. During the mid and late-1700s, the Shawnee Nation was in the area of modern-day Bellefontaine and established a village known as Blue Jacket’s Town. European-Americans arrived in this area during the early-1800s and built homes, farms, and communities. In 1820, Bellefontaine was laid out and in 1835 it became an incorporated municipality. Individuals who visit Bellefontaine will discover a charming Midwestern city. According to the city’s website, Bellefontaine “is a busy and beautiful small community that looks to combine the traditions of yesterday with the progress of today and tomorrow.” Bellefontaine is home to many parks, a regional airport, the Logan County History Center, and a charming downtown area that features shops and restaurants. In Bellefontaine, individuals enjoy an excellent quality of life. It is necessary for residents of Bellefontaine to have access to cooling and heating systems inside their homes. The city is in a region of the U.S. that experiences warm summers and very cool winters. Professional HVAC technicians recommend central air conditioning units and furnaces for installation in Bellefontaine homes. During June, July, and August, daytime temperature highs average in the low-80s. Precipitation is common during these months which creates a humid climate. Central air conditioning units are sufficient to cool Bellefontaine homes when temperatures rise. In addition to cooling units, it is necessary for Bellefontaine residents to have heating systems installed in their homes. During the winter months, freezing temperatures and snowfall are common. The average daytime temperature highs range from the low to mid-30s. Furnaces are sufficient to heat Bellefontaine homes. The systems can literally be lifesavers to residents of the city during the long, harsh winter seasons.